It is common to rate compressed air consumption in Standard Cubic Feet per Minute - SCFM. Europeans normally use one ata and 0 oC as SCFM. The actual air volume flow is often termed ACFM - Actual Cubic Feet per Minute. Inlet Cubic Feet per Minute - ICFM - is used by compressor vendors to establish conditions in front of additional equipment like inlet filter, blower or booster. The Ideal Gas Law is accurate only at relatively low pressures and high temperatures. To account for the deviation from the ideal situation, another factor is included. It is called the Gas Compressibility Factor, or Z-factor. This correction factor depends on the pressure and temperature for each gas considered. Engineering ToolBox, (2005). 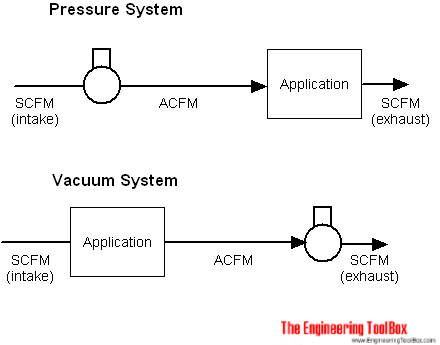 SCFM versus ACFM and ICFM. [online] Available at: https://www.engineeringtoolbox.com/scfm-acfm-icfm-d_1012.html [Accessed Day Mo. Year].